Brand new cars have all kinds of incredible “smart” features, but for those of us who can’t afford to upgrade our rides at the moment the Car Connection from Audiovox provides some of the same functions for a fraction of the cost of a new car. 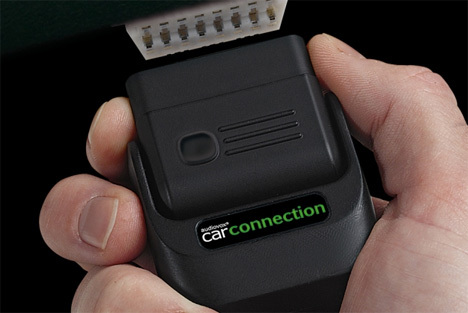 The little device plugs into the car’s OBD-II port, which is standard on all cars produced in 1996 and after. With it, you can keep track of your driving performance, stay on top of needed maintenance, and make your car into a no-phone zone. The device can give you feedback on your driving via your smartphone or computer. It tracks data like fuel consumption and driver performance, then builds reports based on that data. This function is ideal for keeping track of how your newly-licensed teen is doing on the road without you, or monitoring an elderly relative’s safety on the streets. The device will give you tips on fuel economy and safe driving habits. The Car Connection can do all sorts of other cool tricks, like blocking cell phone usage inside the car. It can set up a kind of virtual safety boundary of your choosing, so if Grandpa decides to take your car for a joyride across state lines the device will notify you. If your car is ever stolen (or if you forget where you parked it in a massive parking lot), you can look up the car’s exact location instantly. You can even run reports on the car’s current health and necessary preventative maintenance like brakes and tire pressure. The price tag seems kind of reasonable when you compare it to the cost of buying a new car: $170 purchase price, $20 activation, and a monthly fee of $10 (or a $90 for a year). See more in Cars & Trucks or under Transportation. March, 2013.